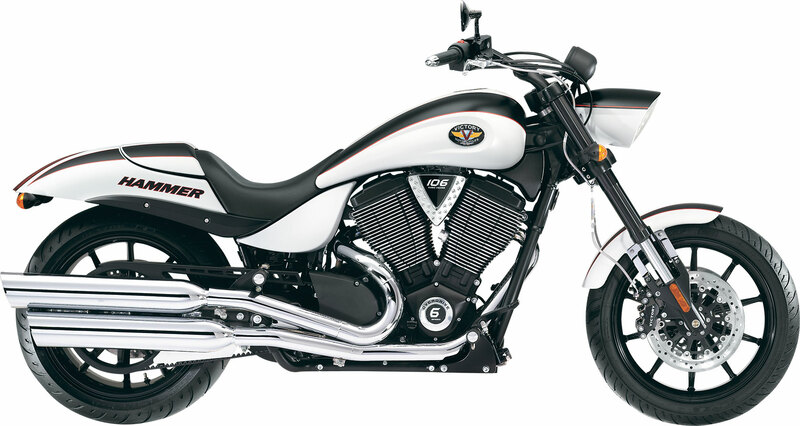 Modern American muscle with custom paint and blacked-out wheels inspires the 2010 Victory Hammer® S Motorcycle. Are you feeling the need? 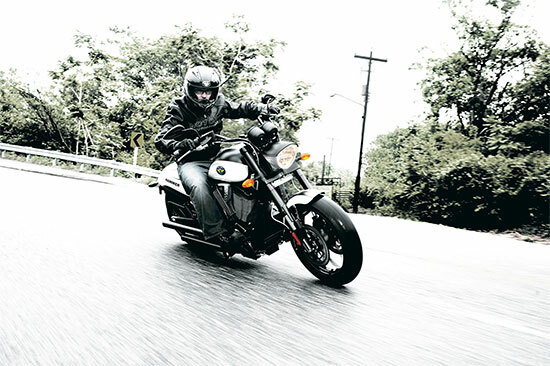 Then try this: a wide 250mm rear tire, 97 horsepower, 113 foot-pounds of torque, inverted front forks, dual-disk front brakes & a speedo & tach — standard. These performance features make such a strong statement that fully expresses the Hammer® S.
For cruising on Main Street or cruising across state lines, the Hammer® S provides a fantastic experience. Find out more about its features, specifications, pricing, comparisons, reviews, videos, images, brochures, downloads, and locate your nearest dealer that has the Victory Hammer® S Motorcycle. The stylish Hammer S rear fender holds a flush-mounted taillight and the fender is chopped in a sport-inspired manner to show off the impressive 250mm rear tire. 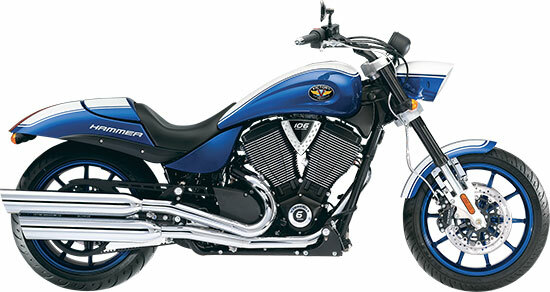 The leader of the pack the Hammer S needs a taillight that is easy to follow – this in the one! It is exceptionally bright and super-stylish with its smart design and flush mounting. A chrome bracket holds the speedo and tach side-by-side for easy to read, heads-up viewing of the bike’s operating data. With its distinctive Hammer S styling, paint and custom wheels, this bike doesn’t need a lot of chrome, so many components are blacked-out, putting the painted bodywork in the spotlight. For total integration of the bike’s custom styling, the headlight bucket features elements of the bike’s paint scheme so the color treatment extends the full length of the bike. The inverted cartridge telescopic fork has 5.1″ (130mm) of bump-swallowing travel and provides a Hammer S rider with smooth, easy steering, in town and on the open road. Enjoy consistently outstanding braking with these dual 300mm floating rotors equipped with 4-piston calipers. 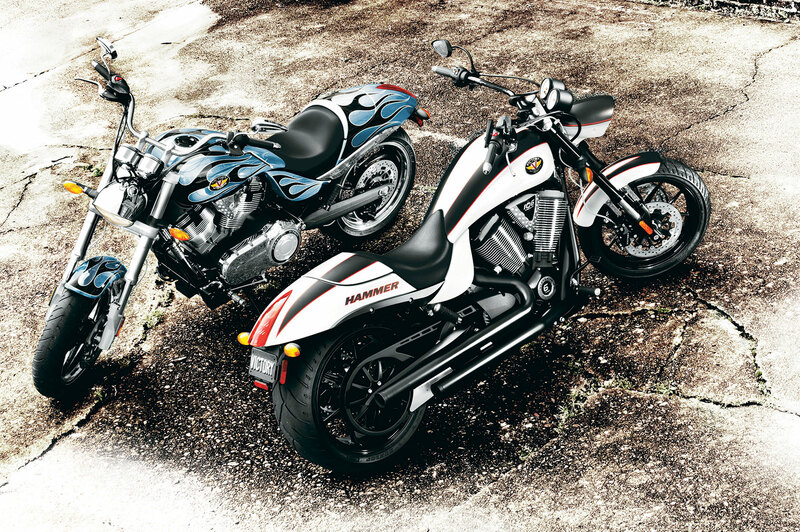 They provide sure stopping that inspires confident riding. The “X-Factor” custom wheels are lightweight and engineered for premium performance. The Suede Black/White model has black wheels, while the Boardwalk Blue model has blue wheels.